As I drove through villages in northern Ghana, bumping along pitted dirt roads and passing mud-splattered men pushing bicycles, the grinding poverty was painfully obvious. Exhausted farmers, some wearing faded football shirts, sprawled in the shade beside mud-built houses. Women chopped leaves for dinner, surrounded by children in tatty clothes. Goats and guinea fowl scavenged among rubbish. In one village after another, people told of their daily fight for survival. Farmers said they couldn’t afford fertiliser. Mothers couldn’t afford medicines for their children. Pupils couldn’t afford pencils. I heard similar stories of hardship six years ago when I last visited this savannah region. ‘In terms of our poverty there have been no changes,’ said Sule Mantable as he planted beans beside a river. I first met Sule, a father of four, in 2012 when I told him his village of Nabari had been chosen for a British aid project designed to prove that big cash injections could transform such deprived rural communities. ‘We don’t believe it will work,’ he said then. And he was right to be sceptical, because now we have the scathing verdict of a five-year study into this project funded by British taxpayers, which lavished £11 million – £2,906 per household – on 35 impoverished villages in Ghana. And the landmark 182-page report for the Department for International Development (DFID) has serious implications for the entire aid sector – and a Government that insists on donating billions to hit its discredited target of 0.7 per cent of gross national income. The Millennium Villages Project (MVP) began in 2005 to show that chucking cash at some of the planet’s poorest places could end extreme poverty, foster diversification from farming and spark sustainable development in just five years. It was created by Professor Jeffrey Sachs, dubbed a ‘rock star economist,’ from Columbia University in New York, backed by the UN and billionaire philanthropists, and promoted by celebrities such as U2 frontman Bono. But the DFID report concludes the project failed to meet many key aims and targets, saying: ‘Far from breaking the poverty trap, the project does not appear to have reduced poverty or hunger at all,’ adding that it had ‘fallen short of producing a synergistic effect’. The authors admit to surprise that ‘the project did not improve some of the outcomes explicitly targeted by the intervention, such as child mortality, immunisation rates, antenatal care, access to drinking water and usage of mobile phones’. They also criticise ‘misguided’ efforts to attract more girls than boys to school and suggest preferential help for some schools drained others of good teachers. Yet ‘the project did not improve children’s cognitive skills’. The evaluation – commissioned by DFID to test the theories and agreed with Professor Sachs – found little difference between villages drenched in British aid and others in the region that were not helped. Although attendance improved at new clinics and schools, incomes rose (‘probably temporarily’) and there was a fall in the impaired growth of children, ‘what has been achieved could have been attained at substantially lower cost’. The report also discloses the dismal, yet all too typical, fact that nearly a third of funds went on management and overheads, while admitting there was ‘large-scale’ fraud involving a key local partner. There is savage irony that far from proving the success of foreign aid, this project – announced by Sachs and Bono on a visit early in 2012 – has ended up highlighting core problems. For a start, there is the dependency culture. Inevitably there were improvements when villages were flooded with cash for new schools, extra teachers and street lights, tractors were lent to farmers and women were given inducements to give birth in clinics. But this was not enough to spark sustainable transformation of poor societies. So in Kpasenkpe, where Sachs made impassioned promises six years ago to hundreds of villagers, I heard desperate pleas for more foreign assistance now that the project has ended. The investigation noted ‘a pervasive expectation for donors to fix problems’ – and that one village adopted a more community-led approach to construction only when funds became limited. But just as in Britain, I found profound cynicism over the aid industry. ‘Lots of white people and NGOs came and made lots of promises but they have not been fulfilled,’ said Michael Diyuri, a farmer in the village of Sariba. ‘They come and ask us questions about our families, our lives and our farming. They never come back. The next year, someone else comes back. They just tick their boxes after listening to our problems. They are using us to earn their money. Michael, 31, a father of one, added: ‘They changed the environment but nothing else. They promised they would change our lives and our poverty. But nothing changed. Then there were claims of corruption. In several villages, desperately poor farmers said they were given fertiliser supposed to be free or bought with cheap loans – if they handed over hefty amounts of their harvested maize or rice to local officials. One farmer, who earned £160 ‘in a good year’, told me he had to hand over one bag of maize in the project’s first year, then three of the nine bags grown the next year. Another said they were forced to hand over food even when crops failed. There were also complaints of blundering outsiders ignoring locals. In Nabari, for instance, the project left five concrete scars with capped pipes sticking out from the fertile red ground, the legacy of failed efforts to drill boreholes for water. In another village, the MVP workers succeeded in drilling a borehole, but it broke after a year. The residents clubbed together to spend £60 on repairs but it broke down again, so children are now missing school to fetch water from a river. At many villages there were complaints that there were no attempts to create jobs with the aid money. Head teacher Abdulai Shefu told me that during the rebuilding of his school in Duu by contractors, locals were used ‘only to carry water and build blocks’ rather than learn new skills. Since the solar power system broke down after a year, there is now an empty room that once held seven donated computers. There is another filled with broken furniture, so many pupils must sit on the floor. His school has lost five teachers since the MVP scheme ended last year, leaving six others to hold lessons for up to 200 pupils at a time. Outside the classroom, the sad sight of a broken swing in the playground, surrounded by collapsed wire fencing, seemed to symbolise this scheme’s apparent failure to create enduring change. Health clinics have seen sharp falls in attendance and often run out of drugs. ‘If the situation stays like this, our clinic will close since there is no money,’ said one nurse. These schools and clinics are emblazoned with inscriptions about British funding. Yet for all the fine intentions, they show the futility of attempts to impose lasting development in poor places with sudden flows of funds from abroad. 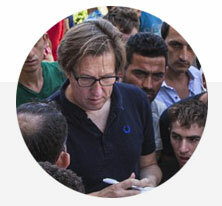 Michael Clemens, a senior fellow at the Center for Global Development think-tank, praised Dfid for its investigation of such a high-profile scheme. He said it proved the project had not achieved its self-declared aims of assisting poor parts of rural Africa to lift themselves out of poverty in five years. ‘The project failed to do that. Full stop,’ he said. Clemens argues that development cannot be imposed by outsiders and he believes the cause is harmed by diverting scarce resources into ‘flashy, one-off, quick-fix projects that promise to solve everything in a few years’. A Dfid spokesman insisted its programme helped reduce poverty, but admitted it did not meet its aim of achieving Millennium Goals – a UN initiative to combat poverty, hunger, disease, illiteracy, environmental degradation and discrimination against women. Sachs remains unbowed, pointing to a recent article in The Lancet he co-authored for ‘independent analysis’, insisting the new report’s ‘cost effectiveness observations were a joke’ and saying that the authors had never built schools and clinics themselves. Sachs claimed he told Dfid that five years was not enough time to realise all the Millennium Development Goals, and added that there were ‘many notable advances in the MVP’ and other projects across Africa. ‘To say the project failed would be to deliberately misrepresent the truth,’ he said. Certainly debate over sending torrents of Western cash to spur progress in poorer parts of the world will continue. But there is no doubt this highly significant report has dealt the cause – and leading figures in the aid lobby – a severe blow. Perhaps Sachs and his friends should stop sermonising and head back to Ghana. For not one of the people I met in these villages said their prosperity had advanced with these giant dollops of British aid, despite their gratitude for new clinics and schools. Indeed, it is hard not to wonder if these African villagers have a better understanding of their own development issues than all those Westminster politicians blowing billions on neocolonial policies, egged on by sanctified professors and rock stars. For as that dedicated head teacher struggling to sustain his school in Duu told me, you must put local communities at the centre of development to create lasting progress. ‘It is not just about money,’ he said, wisely. Why are repressive regimes given the succour of British aid?